Known only by his hao or sobriquet, Baishi was one of the finest carvers in any organic material used in the making of snuff bottles. He also carved in amber. His works are always superbly carved and meticulously detailed and of a distinctive, scholarly style, often including inscriptions in archaic script. The style is unmistakable, and although unsigned, the carving on this bottle is unquestionably by Baishi. This is made even more obvious by the similar subject of the scholar being offered the jue, carved in identical style, to one formerly in the J & J Collection (Moss, Graham, Tsang, The Art of the Chinese Snuff Bottle. The J & J Collection, no. 283, and sold in these rooms, 22 March 2007, lot 9), but combined there with an inscription, and date corresponding to 1836. Other examples include the celebrated bottle form the Edmund F. Dwyer Collection, illustrated by L.S. Perry, Chinese Snuff Bottles. The Adventures and Studies of a Collector, p. 130, no. 125, and by B. Stevens, The Collector's Book of Snuff Bottles, nos. 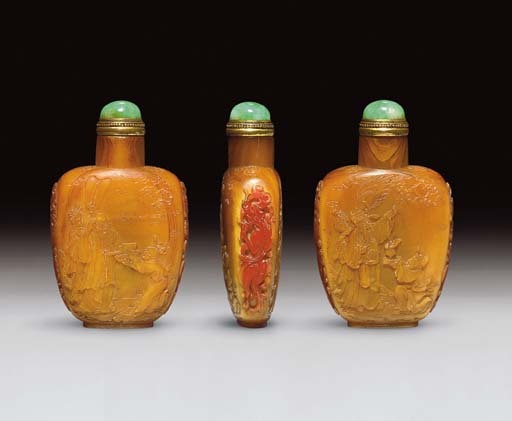 736 and 737, and now in the collection of Charles V. Swain (dated 1843); a bottle from the Ko Collection illustrated by R. Kleiner, Chinese Snuff Bottles from the Collection of Mary and George Bloch, no. 193; a bottle dated to 1836 from the collection of Edgar Wise, illustrated by B. Stevens, The Collector's Book of Snuff Bottles, no. 738; the bottle dated to 1843 illustrated by J. Ford, Chinese Snuff Bottles. The Edward Choate O'Dell Collection, no. 76; one illustrated by R. Kleiner, Chinese Snuff Bottles. The White Wings Collection, p. 227, no. 159; and two further examples illustrated in Chinese Snuff Bottles No. 5, pp. 93 and 94, the latter of which is in the Art Institute of Chicago. The subject matter here, of a dignitary wearing an official hat and pointing towards the sun as he is being offered a precious bronze tripod wine vessel (jue), symbolizes a wish for promotion to the highest rank, while the similar scene on the other main side suggests that the successful scholar is being presented with his official hat - although it is obviously drawn from a more ancient time than the Qing dynasty, since the style of the hat changed in the Qing. Combined they celebrate both the elevation to the rank of official for the successful scholar, and the aspiration to climb to the highest levels of the civil service.